Osteoarthritis (OA) is the most common form of arthritis and one of the leading causes of pain and disability in the knee. Thanks to recent research and government guidelines into the causes of knee OA and its treatment, we are able to offer a more effective approach to the management of this condition. Arthritis can be defined as a group of diseases affecting joints and their surrounding tissues. It occurs in various forms, such as bacterial arthritis, osteoarthritis, or rheumatoid arthritis and is characterised by the presence of inflammation, pain, swelling and stiffness of the joint(s). The aims of this guide are to provide you with information about knee OA and the management options that are currently available. A joint is the space between two or more bones that allows movement to occur. 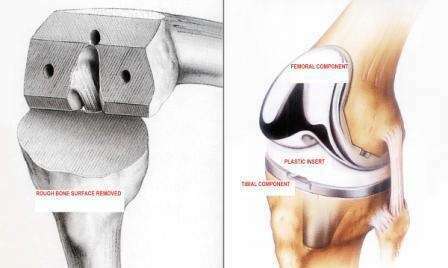 The knee joint is an example of a ‘synovial’ hinge joint. A synovial joint is made up of adjoining boney surfaces that are covered by articular cartilage and connected by a fibrous connective tissue called a capsule. The capsule is lined with a synovial membrane that secretes synovial fluid, a naturally occurring lubricant that nourishes a joint and helps it to move freely. The knee is made up of three bones; the femur (thigh bone), the tibia (shin bone) and the patella (knee cap). The design of the knee joint allows the knee to bend (flex) and straighten (extend), as well as rotate a little. 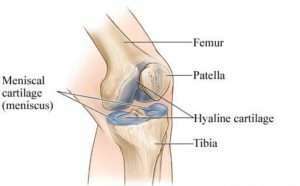 The surfaces of each of the bones that make up the knee joint are covered with a protective layer of firm, flexible material called ‘hyaline cartilage’. This provides a smooth surface for joint movement and helps to absorb shock and distribute forces evenly within a joint. The knee also possesses two ‘meniscus’. These are cup-shaped areas of cartilage that sit on top of the hyaline cartilage at the end of the tibia to give the knee additional shock absorbance and stability. Contrary to popular belief, osteoarthritis is not simply caused by ageing of the joints and is not always painful. 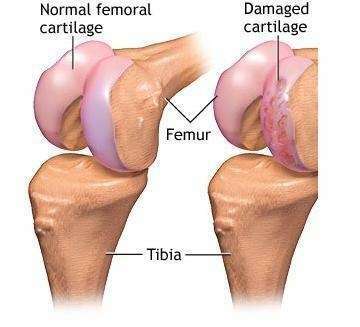 It is, in fact, a normal active repair process that takes place in all joints and involves loss of hyaline cartilage and remodelling of adjacent bone(s). It is only when the natural repair process of the joint starts to fail, due to overwhelming trauma to a joint or long-standing abnormal levels of stress on the joints, that the OA joint becomes painful. In joints of a person with OA, the hyaline cartilage covering the affected bones becomes damaged and starts to thin. This results in an increase in stress through the bones of the joint due to a loss of cartilage protection. Although it is the hyaline cartilage that is implicated in OA, the menisci of the knee may also become worn leading to more stress on the hyaline cartilage and more ‘wear’ of the knee joint. Within the knee there are three separate compartments; the medial, lateral and patellofemoral compartments. The medial compartment is the joint between the inside half of the femur and the inside half of the tibia, the lateral compartment between the outside half of the femur and the outside half of the tibia, and the patellofemoral compartment between the patella and the femur. OA can occur in any one or more of the compartments of the knee, but most commonly it is seen throughout the knee joint. Knee OA results in pain, stiffness and limited movement of the knee joint. Often people complain of stiffness in the knee(s) first thing in the morning or after a period of immobility, for example, sitting for prolonged periods of time. The stiffness is often eased with gentle activity such as walking, although in more severe cases even short walks can be painful. Occasionally, joints can swell up and become inflamed making the knee feel tight. People may also report that their knee’s ‘creak’ or ‘crunch’ when they walk or squat. This can be a symptom of knee OA, although this is not always the case, as lots of healthy knee joints make these noises too! The severity of symptoms can vary greatly. Some people may have very advanced OA and feel very little pain, whilst others may have severe pain but with very little ‘wear’ of the joint present on x-ray. When knee OA is more advanced it can have a major impact on all aspects of life, including walking, enjoying hobbies and even sleeping comfortably. The diagnosis of knee OA may be made by your consultant or physiotherapist. Following a thorough case history and physical examination, a diagnosis of knee OA can be provisionally made. 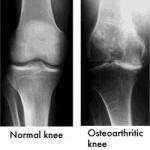 To confirm this diagnosis an x-ray of the knee joint can identify the presence of OA and its severity and location within the knee. An MRI scan may sometimes be required to differentiate knee OA from other pathologies, such as a meniscus tear. However, an MRI scan is not as effective as an x-ray in observing the quality of the bony surfaces of the knee joint. What are the management options for knee osteoarthritis? It is important to take a holistic approach to both the assessment and management of knee OA. This should include consideration of the physical, social and emotional affects that the symptoms have on the patient. Management options for knee OA can be divided into conservative (non-surgical) management or surgical management. Conservative (non-surgical) management should always be the initial form of ‘treatment’ for OA knee. This may often involve seeking help from more than one healthcare professional and include a variety of treatment options. Your GP can help ensure you receive the most appropriate pharmaceutical management, i.e. painkillers, whilst a physiotherapist can help manage knee OA using physical treatments. This may include the use of acupuncture, manual therapy or massage and specific exercises to improve your strength and fitness levels. Maintaining a healthy body weight by keeping to a well-balanced diet and taking regular low impact exercise, for example, cycling and swimming, are also important to help maximise the health of your knee(s) and prevent further joint deterioration. Surgical management is sometimes necessary if there are signs of advanced knee OA that has been resistant to conservative management and is causing significant levels of physical, social and emotional difficulty. The decision on whether knee surgery is appropriate is made by a consultant surgeon. The most commonly performed surgery for advanced knee OA is an ‘arthroplasty’, or joint replacement. During this procedure either the whole of the joint is replaced, known as a total knee replacement (TKR), or only one half, known as a unicompartmental knee replacement (UKR). As well as joint replacements there are now other surgical procedures that can be very effective in the treatment of less advanced forms of OA that cover a smaller area of the knee. The choice of which surgical technique to use depends on a number of factors. These include the severity and location of the OA, the age of the patient and activity. A knee replacement is usually done under general anaesthetic or after an epidural injection. The knee joint is opened up to allow the surgeon to smooth off the roughened and worn out ends of the femur and tibia. If the bones have become more worn on one side or the other (if the inside half of the joint wears away more then your leg becomes more bowed and vice versa) then the surgeon can correct this to ensure that your leg is straight by the end of the procedure. The ends of the bone are then resurfaced with metal prostheses, a flat plate on the top of the tibia, and a contoured cam for the end of the femur. A plastic bearing is then fitted between the metal surfaces and this produces a very smooth surface to allow the joint to bend, straighten and twist like a normal knee. The surgeon usually, but not always, replaces the back of the knee cap with a plastic button. This is called a total knee replacement. If the wear in the knee is only present in one half of the knee then most surgeons will suggest only replacing this half of the knee, leaving the remaining normal knee surfaces untouched. This unicompartmental knee replacement (UKR) has some advantages over TKR in that patients tend to recover slightly quicker, and are more likely to feel like it is their own knee rather than a replacement. What will happen after knee replacement surgery? Following the operation, you will wake up with a bulky dressing around your knee and a tube connecting your knee to a drain which collects blood from your knee. This drain is usually only in place for the first 24 hours after your operation. The blood that is drained can be filtered and given back to you via a drip. This has greatly reduced the need for post-operative blood transfusions following knee replacement. Once the drain has been removed and you have recovered from the anaesthetic you will be allowed to begin walking with the supervision of the ward physiotherapists. You will be able to fully weight bear on the operated leg straight away, but will need to use walking aids, such as a pair of crutches or walking sticks to help support your knee in the early stages of your recovery. You will be offered painkillers to enable you to sleep comfortably and begin exercising your knee effectively. It is very important that your pain levels are well controlled following surgery. You must let the ward staff know if this is not the case. The knee may be swollen and bruised, so you should keep your leg elevated when not walking or exercising. The use of ice is also permitted if the knee is swollen. The ward physiotherapist will help you with icing your knee whilst you are on the ward. When you go home it is important to continue icing your knee to manage the swelling of your knee. You should ice your knee for no longer than 10-15 minutes at a time. Please note that you should not place an ice pack directly on the skin but you should place the ice in a damp towel before you apply it. The ward physiotherapist will give you some simple exercises whilst you are still in hospital to help with your recovery. The exercises will aim to get your knee comfortably moving again, strengthen your muscles and aid your circulation. At the time of your discharge from hospital, you will typically have arranged a physiotherapy appointment. Out-patient physiotherapy should begin approximately two weeks after surgery. Two weeks after the operation you will be seen by a nurse who will examine your wound and usually remove all dressings. The stitches used are internal and will dissolve over time, therefore you will not need to have them removed. Skin clips are sometimes used and will be removed by the nurses at two weeks. Six weeks after your operation your consultant will see you in clinic to review your knee. You will have a routine check x-ray of your knee at this time to ensure the replacement is satisfactory. You will then be reviewed at six months and one year from the operation by your consultant. If there are any complications with your rehabilitation your physiotherapist may refer you back to your consultant for a further review and will liaise directly with the consultant about any issues. Infection (<1%) can almost always be treated with antibiotics and usually just involves the skin. If bacteria get into the knee itself then it may be necessary to open the knee up and wash it out with saline solution and give stronger antibiotics via a drip. On very rare occasions it may be necessary to remove the knee replacement completely to allow the bacteria to be treated. It is then re-replaced, either at the same operation or after an interval of four to six weeks. Swelling and bruising around the knee joint is common after knee replacement surgery. The swelling may feel tight and a little uncomfortable around the knee initially, although if it becomes so tight as to become very painful then you should contact the clinic and speak to your physiotherapist or surgeon. Deep vein thrombosis (DVT, <1%) is a complication of any knee surgery but is unusual if early mobility is encouraged after surgery. A DVT is characterized by pain, swelling, warmth and redness of the calf. Less commonly, a DVT can also present in the thigh area. Stiffness will always be present in the early post-operative phase but will lessen with exercise and physiotherapy. Your rehabilitation begins immediately after surgery. Initially you will be seen by a ward physiotherapist who will show you some simple exercises to help you start moving your knee. You will also be given exercises to help maintain the circulation and strength of your legs. The physiotherapist will also help you to regain your mobility with the use of walking aids, for example walking sticks. Once you are safe and confident to walk independently with a walking aid and you begin regaining movement and strength in the knee you will be able to return home. Within about 2 weeks after surgery you will normally begin your out-patient physiotherapy. When arranging your physiotherapy you should choose an experienced physiotherapist with expertise in knee rehabilitation. It’s the job of the out-patient physiotherapist to guide you through your recovery safely and ensure you achieve the best outcome following surgery. The time it takes to recover following a knee replacement varies from one person to the next. There are many factors that determine the rate of recovery following surgery and how soon someone returns to physical work or recreational activities, including sport. One of the biggest factors that will determine the rate of recovery and long-term outcome following surgery is your motivation and adherence to rehabilitation. Also, before your operation it is important that you take steps to ensure you keep your body weight controlled and your fitness and strength levels good. By doing this you improve your chances of a speedy recovery and lower your risk of complications after surgery. The rehabilitation following a knee replacement is split into three different phases (early, middle and late). Within each phase there are specific goals that your physiotherapist will help you to achieve. Once you have achieved all the goals in each phase you will be able to move on to the next phase of your rehabilitation. The time it takes to progress to the next phase will vary from person to person, so the timeframes that have been included in this program are only an approximation. For those patients who wish to return to sporting activities the use of a gym would be beneficial, although it is not essential. You may wish to consider joining a gym in order to be able to use exercise equipment regularly. When considering a return to driving following surgery it’s essential that you consider the safety of yourself and other road users. After six weeks it is usually safe to return to driving following a knee replacement. By six weeks you will have regained sufficient mobility and strength in the knee to effectively use the pedals of a car, including pressing firmly on the brake pedal in the event of an emergency stop. You will be advised by your surgeon or physiotherapist when it is safe to start driving again but you should also check with your vehicle insurer to confirm you are covered. When can I start back at work? The time when you can return to work depends entirely on the type of work you do. If your job is sedentary, for example desk-based work, you should be able to return to full duties six weeks after surgery. If your job requires you to be on your feet for longer periods of time, you may need to make a phased return to full duties gradually from six weeks onwards. Jobs that require a greater degree of manual work and physical demand, for example lifting and crouching activities, may require three to four months before the knee is strong enough to perform all duties safely. Again, your surgeon or physiotherapist will give you advice on when to return to work.